Different states have different rules and regulations. 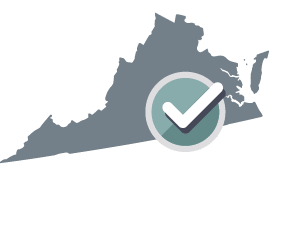 Your Offer to Purchase Real Estate will be customized for Virginia. The legal description of the Property is as follows: ___________________________________________________________________________________________________________________________, which includes the fixtures and improvements located on the Property that are listed within this Offer. All property included within this Offer is referred to as the "Property". The balance of the Purchase Price will be paid in cash or equivalent in financing at closing unless otherwise provided in this Offer. The balance will be subject to adjustments. The Closing Date will be on or be prior to April 19, 2019 or at such other time agreed by the Parties, at which point the Buyer will take possession of the Property. If any terms or provision of this Offer will, to any extent, be determined to be invalid or unenforceable by a court of competent jurisdiction, the remainder of this Offer will not be affected and each unaffected term and provision of this Offer will remain valid and be enforceable to the fullest extent permitted by law. Headings are inserted for the convenience of the Parties only and are not to be considered when interpreting this Offer. Words in the singular mean and include the plural and vice versa. Words in the masculine gender mean and include the feminine gender and vice versa. Words importing persons include firms and corporations and vice versa. Time is of the essence in this Offer. Every calendar day except Saturday, Sunday or US national holiday will be deemed a business day and all relevant time periods in this Offer will be calculated in business days. Performance will be due the next business day, if any deadline falls on a Saturday, Sunday or US national holiday. A business day ends at 5 p.m. local time in the time zone in which the Property is situated. This is an offer to purchase the Property on the above terms and conditions. The Seller has the right to continue to offer the Property for sale and to accept any other offer at any time prior to acceptance by the Seller. If the Seller does not accept this offer from the Buyer by April 19, 2019, this offer will lapse and become of no force or effect. _____Acceptance of offer to purchase: The Seller accepts the foregoing offer on the terms and conditions specified above, and agrees to convey the Property to the Buyer. _____Counteroffer: The Seller presents for the Buyer's Acceptance the terms of the Buyer's offer subject to the exceptions or modifications as specified in the attached addendum. _____Rejection: The Seller rejects the foregoing offer. What is an Offer to Purchase Real Estate? An Offer to Purchase Real Estate is a legal document used by someone who wishes to place a bid on a house or other private residence that is for sale. The document contains a description of the property for sale, the price being offered for the property, the proposed closing date and possession date, and other important details concerning the potential sale. What types of offers are there? An Offer to Purchase Real Estate can be a firm offer or a conditional offer. A firm offer means the buyer is willing to purchase the property without any specified conditions. If the seller accepts a firm offer, the transaction can be completed without further negotiation. A conditional offer requires that one or more prerequisites be fulfilled before the purchase can be made official. What conditions can be placed on an offer? A home inspection performed by a licensed inspector: discovers any damage or defects in the house and attached building. Seller must arrange to have specific things done to the property before the buyer takes possession: painting, carpet cleaning, repairs, etc. Why should I use an Offer to Purchase Real Estate? Using an offer letter lets a potential buyer bid on a property without fully committing until all of the conditions are met. It also helps the seller to determine whether or not they are able to meet the terms of the conditional offer, which can save both parties time and help to avoid potential issues in the future.